One of Ilya and Emilia Kabakovs’ ships of tolerance will open in New York this month. The famous conceptual artist and his wife have already boarded his “symbol of good relations among people” in Venice, Miami, Sharjah and other cities around the world. 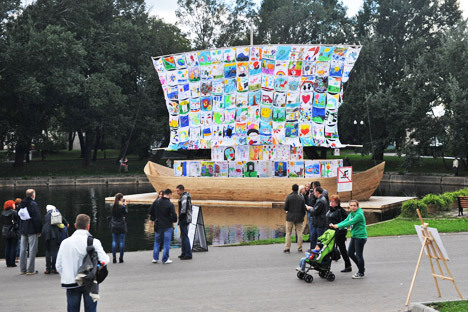 Before their 60-foot ship with colored sails made up of children's drawings was installed in Gorky Park’s Pioneer Pond, Moscow schoolchildren listened to lectures on tolerance for four months and worked on their paintings for the sail. It is through such joint efforts that this project was implemented. We boarded the first ship in the Egyptian city of Siwa, located on the shores of a salt lake. They have never had ships there before, and we decided that the children should make the sails. There is a very serious religious community in this place: Everything is done strictly according to set rituals. After a girl gets married at the age of 12, she is not allowed to go into the street at all. And so on. The ship was built by students from Manchester, 17–18 year-old boys. While they were building, I noticed how successfully they interacted with local children — not speaking the same language, not knowing each other, having no idea of who is who in a different culture. The next ship was made in Venice. There are many immigrants in Italy and the issue of tolerance is very crucial there. Children at schools are always bullying each other; there is a lot of aggression, racism and many other problems. So we organized a six-month course on tolerance. Ilya Kabakov lives in the United States, but he was born in the Soviet Union and became known as one of the founders of the Moscow conceptual school. He started as a book illustrator and was an active member of dissident exhibitions. Kabakov's “Beetle” ($5.8 million, 2008) and “Luxury Suite” ($4.1 million, 2006) are two of the most expensive pieces of contemporary Russian art ever sold. His artwork is exhibited in Moscow’s Tretyakov Gallery, St. Petersburg’s State Hermitage Museum, New York's Museum of Modern Art, and in other prestigious international collections. The idea [of the course] was the following: People need knowledge about culture to be able to get along, to understand each other and to avoid wars. Culture is a way to learn more about another person, and the easiest way to do this is to use visual images. Washing off differences helps people to establish good relations. You cannot respect people, if you do not know anything about them. Everything is based on two main things — knowledge and respect. In Siwa, we worked with children of ages 8–16. In Venice, the children were between 6 and 17 years old. Later, we removed the older children, because we found that, at this age, they find it very difficult to talk; they are shy when among their peers. They think that, if they express their opinion, others will look at them critically. Criticism from other people has already been integrated into their way of thinking. They are not free anymore, while younger kids are absolutely free to say what they think and give incredibly interesting examples. A boy from Cuba drew an interesting picture — a dish of fruit, some flies are flying over it, and there is a spider web with a spider over the flies. All the other kids drew black and white children, the sun and things like that. We asked: “Why all of a sudden fruit, flies and a spider? What does this have to do with tolerance?” Then the boy explained: “The flies want to eat the fruit, but they are tolerant; they know that the fruit is for the children. The spider wants to eat the flies, but it is also tolerant, and it controls itself.” Very easy to understand, isn’t it? Society is not tolerant anywhere. When people express their opinions in public, everyone is trying to look tolerant, because we are a democratic society. Showing intolerance compromises the person. You have to spare the feelings of the other person. In the West, this is in people’s blood, while what people really think is a different matter — and this is where everything is usually very miserable. In every culture, we have friends and enemies. Yet their hate and love are based on something. Therefore, if we wish to engage in a dialogue, we need to understand where the foundations of this hatred and love are. For what things do they respect us and for what things do we respect them? These things exist—you just have to identify them. The ship is a universal symbol. The ship is a way of transferring knowledge about other civilizations and different cultures. In Cuba, for example, it was seen as a symbol of escape. It is topical for them, as the Cubans fled from tyranny in ships. In Russia, for example, tolerance is uniquely associated with gays and anti-gay laws. This issue is of vital importance now in our country. We were asked to make the next ship in the Mexican Tijuana. What's going on there? There are drugs. There is a war. They are shooting in the streets and children are dying. That means we need to go there and discuss this. A plane with 15 children arrived in Moscow: They are ambassadors of tolerance from Miami. A ship was boarded there three years ago. A boy—who, at that time, was six years old—is nine now, and he decided to continue. He gathered his classmates, they drew pictures, and these pictures are here in Moscow. After that, they will all fly to New York to attend the inauguration of the ship there. Something is awakening in these children. The ship is not so much an art project, but rather a social one. Yet, in general, our main project in Moscow is the exhibition “Utopia and Reality?,” which is associated with the great avant-gardist El Lissitzky, Kazimir Malevich’s colleague. We are preparing to take part in the exhibition of the Monument in the Grand Palais of Paris, which will be held next spring. There will be a “total installation” of a “Strange Town”: We are building huge buildings (each 82 feet tall) and city walls. There will be exhibitions held in Mexico, the United Arab Emirates and Switzerland, and one more ship of tolerance will be opened in New York on Sept. 27.